Dana DiFilippo at the Philadelphia Daily News reports on the naming of a wounded Philly cop as the National Police Defense Foundation's Man of the Year. A Philadelphia police officer who chased down his armed attacker even after he was shot three times will be honored by the National Police Defense Foundation as its Man of the Year. 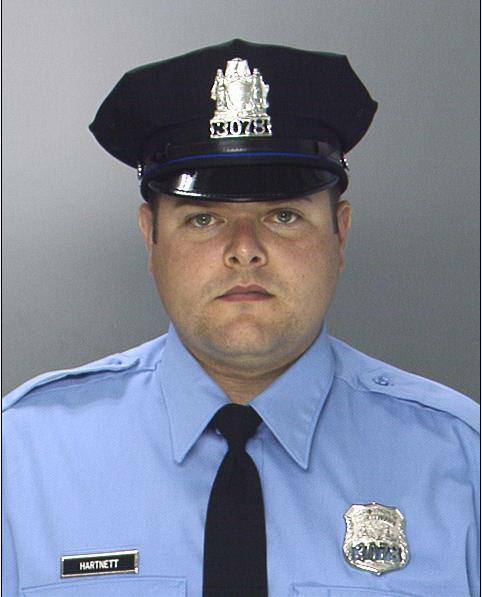 Officer Jesse Hartnett, 33, was sitting in his patrol car on Jan. 7 in West Philadelphia when a gunman approached on foot and fired 13 times into the cruiser's lowered window at Hartnett. As the gunman fled, Hartnett was able to chase him down, even though he'd caught several bullets in his left arm, and shoot his attacker in the buttocks. Edward Archer, the alleged attacker, later swore allegiance to ISIS and is scheduled for a preliminary hearing March 10 on attempted murder charges. "This is in recognition of [Hartnett's] heroic efforts in the performance of his duties," said Joseph Occhipinti, executive director of the New York-based National Police Defense Foundation. "He is truly a law enforcement professional who demonstrated professionalism and valor in spite of grave danger. He's a cop's cop."